For nearly 100 years, Pitco has been a growing leader in the food service industry. By offering some of the most innovative designs on the market when it comes to fryers and pasta cookers, Pitco hopes to make it easy for you to give your customers the best fried foods out there. It all began back in 1918 when the then Pitco team hoped to build a simple piece of equipment for frying; from this they created the frialator which was then patented. With this history under their belt, Pitco has easily become a leader in design, research, and delivery of new ideas, while constantly expanding on their reliability and efficiency. With a top-quality design meant to boost efficiency and maintain flavor of your french fries, chicken fingers, or onion rings, Pitco aims to provide the best fryers on the market. Through specific designs as listed below, Pitco strives to stay above their competitors at all times. Pitco laser cuts all important sheet metal parts so you can be sure your piece of equipment is assembled with the best quality. By using robotic welding techniques on their fryer tanks, Pitco strives for maximum accuracy and top-of-the-line manufacturing. Pitco features pressure-blasted fry tanks rather than ground tanks to provide easier cleaning, the absence of scorch marks, and a greater tolerance at pressure points. By using a tube heating system, the frialators are able to transfer larger amounts of heat and food can maintain more flavor. With a bigger cool zone than other competitors, Pitco’s frialators avoid shortening breakdown while providing you with less mess to clean. Being a leader in an industry takes time and dedication. 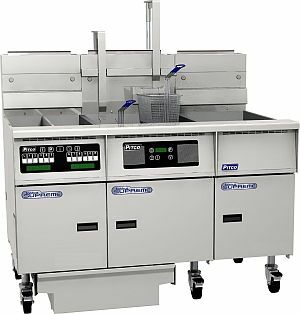 Since 1918, Pitco has successfully developed new technology to further boost them to the top of the line in the fryer industry. First to incorporate cool zones, built-in filtering, and under cabinet filters designed to save space. Pitco’s new solstice series features a line of fryers that perform cooler and smarter for the utmost efficiency. Pitco offers the most Energy Star fryers in the world.